Keep up to date with the change you're making. Recently we introduced you to the children of Los Discipulos de Jesús, a private foundation in Medellín, Colombia that runs based on the generous donations of the public to house children that have cancer and their families. These children and most times, their mothers, move to Los Discipulos de Jesús for treatment that can take up to a year. Whether you’re a beginner in the world of dance, or have been performing your whole life – nothing can compare to the feeling you get when you first step foot on stage. 8T Arts Company is a non-profit dance studio Soul Dancers has been fortunate to work with since our conception. The holiday season was a busy one Soul Dancers as we were spreading love and spreading joy to the children that need it most. We've been busy over here at Soul Dancers attending each and every foundation we support to provide donations in various forms to the children in need. Below are some photos to showcase some of the smiling faces we've had the privilege of visiting. The beautiful children of La Casita de Maria receive weekly English lessons in addition to their dance classes, because here at Soul Dancers we not only want to provide the gift of dance to nourish, empower and inspire – but we want to ensure these children have all the wonderful opportunities and experiences available to them as they develop so they can flourish in life. With our Canadian friends celebrating Thanksgiving this weekend, we can’t help but reflect on what we’re thankful for. We shouldn’t need a holiday or a certain occasion to be reminded to be grateful for what we have. We are overwhelmed everyday at the generous hearts we encounter through our charity work with Soul Dancers. A lot of people might think the meaning of charity means solely to donate a dollar amount towards a cause, but this isn’t the case. La Posada de Moisés is the most recent foundation Soul Dancers has taken under our wing located in Medellín, Colombia. As we’ve shared, you know this foundation assists 41 children in vulnerable situations with the necessities of a happy life. Today we would like to introduce you to some of these amazing little souls here on our blog. First, meet Ismael Pabón Muñoz and Maximiliano Pabón Muñóz. Ismael is three years-old and Maximiliano is five years-old, and they joined the foundation on August 22, 2016. Unfortunately these two boys have been displaced twice, from San Luis and Belén La Capilla. Their father is part of the armed conflict and has dedicated his life with a mission to persecute the mother of his children, thus providing an extremely difficult situation for their mother to raise them. Sadly their mother lives almost hidden and wanted to seek help at the Mayor's Office of Medellín for protection for herself and her children, leading her to La Posada de Moisés. Isamel is very quiet, intelligent, speaks very well and at the moment is a very happy child. Maximilliano is very bubbly and playful. Both boys have adapted well to their new lives in the foundation, and look forward to the dance lessons and English lessons they receive each week. Briyit Sofia Calderón Morales is a beautiful two year-old girl who joined the foundation on March 11th of this year with her two siblings. The parents of these children are street dwellers that got caught up in some bad habits and abandoned them at a young age. Briyit is a very extroverted girl, who likes to chat with anyone she meets – she has adapted very well to life within the foundation and gets along famously with the other children. Nikoll Pacheco Pereira is three years-old and joined La Posada de Moisés on January 11, 2017. With five siblings, she is the youngest of six children. Unlike the other children we introduced, her mother is also at the foundation – working in the kitchen. Up until Nikoll joined the foundation, her older siblings watched her while her mother worked. However, this was not the life she wanted for her daughter as she was not cared for in a proper way. Nikoll’s mother decided to look for a job where she could keep an eye on her daughter and take care of her. Nikoll is a very smart girl, however, she is very stressed and eating habits are poor due to the difficulty she’s had transitioning into the foundation. Monday afternoons during dance lessons are the happiest time for Nikoll where she forgets all her troubles and is able to be a little girl again. Jincela Rueda Sánchez is seven years of age and joined the foundation in February 2017. The youngest of six children, her situation is very difficult. Up until recently she lived with her mother on the shore of the Cauca River. One day during a flood on the river they lost their house, and afterwards their mother struggled to find footing. Sadly, Jincela’s mother packed her clothes in a sack and stopped her on the shore of the Cauca River, abandoning her with no place to go. Fortunately she was able to reunite with her brother at the foundation and has adapted easier because of this. Jincela is quiet and withdrawn, and unfortunately her face reflects a very sad girl. Our mission at Soul Dancers is to nourish, empower, and inspire the less fortunate through the gift of dance. We want these children to not only feel happiness through our programs but an increase of self-esteem, self-worth and motivation to keep a positive outlook on life despite their struggles. These children are kind and resilient and they all deserve love. Isn’t that what we all need? Soul Dancers is a charitable dance movement by Limelight Teamwear. Our mission is to nourish the body, inspire the mind and empower the souls of impoverished women and children through the gift of dance. It’s important to express how very grateful we are for those who have donated or purchased official Soul Dancers apparel. We thank you for being a part of this amazing movement to give women and children the opportunity to enrich their lives. Every week, the children of Fundación Ángel de la Guarda receive English and dance lessons through the support of Soul Dancers, which provides each little girl with more confidence to overcome their problems. This space allows them to have fun and live in a proper shelter far away from the risks they would be exposed to when staying on the streets. It’s been a few weeks since we posted an update about our partnership with Army of Sass through the 'No Good Dancer Left Behind Campaign' (#NGDLB), and we wanted to keep you in the loop with our amazing success! Sebastian and Yulie’s Visas were accepted and thanks to all the donations received through the #NGDLB campaign, we are elated to announce they will be visiting Canada to attend the Calgary Dance Teacher Expo from July 21st to July 23rd to further their dance education! Sebastian and Yulie are amazing souls from Medellin, Colombia, who work tirelessly for Soul Dancers to help underprivileged children through the gift of dance, English lessons, art lessons, and so much more. Born and raised within the infamous “Pablo Escobar” region, these individuals have completely immersed their lives in dance when they barely had the means to do so. The thought of traveling outside of Colombia was never a dream of theirs prior to connecting with Soul Dancers, as they never thought that it would be possible. This trip to Canada is an absolute miracle for Sebastian and Yulie. They will be flying into Toronto on July 15th to sightsee for a few days prior to leaving for the Calgary Dance Teacher Expo. This is an amazing gift to help these wonderful individuals and to thank them for all the great work they do for the Soul Dancer’s charity and the impoverished children in Medellín, Colombia. We cannot thank Army of Sass enough for their time and fundraising efforts. We love everything that you stand for! One person cannot do everything, but everyone can do something – and what a world of a difference we can make when we work together! 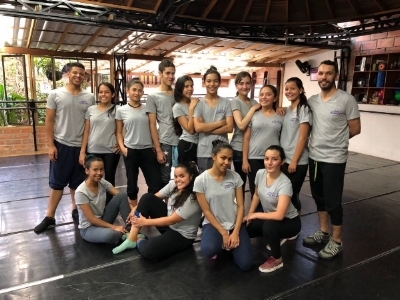 We will always have a special place in our hearts for the Villa Danza Academy in Colombia, as these were the first kids Soul Dancers met on our journey. This group of boys and girls are incredibly kind and humble, despite the difficult conditions they live in.